The contest is now open for entries. Public are welcome to participate. The Office of the Government Chief Information Officer, the Hong Kong Police Force and the Hong Kong Computer Emergency Response Team Coordination Centre have jointly organised “We Together! Secure Data!” Poster Design Contest. The Contest aims to encourage the public to adopt data protection best practices, enhance their awareness of cyber security and draw their attention to the importance of information security. Through this contest, participants could get across data protection message to the public and the industry in a creative manner. The objective of the “We Together! 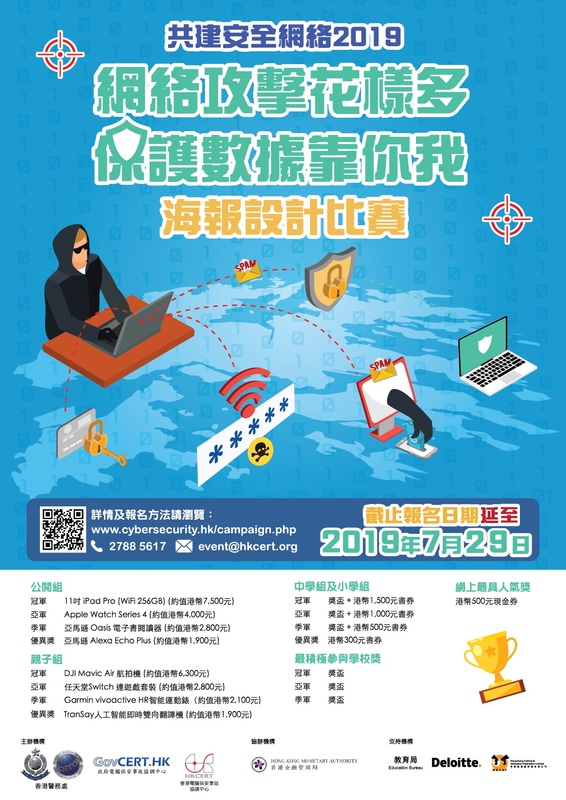 Secure Data!” Poster Design Contest is to encourage the public to adopt data protection best practices, enhance their awareness of cyber security and draw their attention to the importance of information security. Through this contest, participants could get across data protection message to the public and the industry in a creative manner. All finalists will be uploaded to the “共建安全網絡” Facebook page (https://www.facebook.com/buildsecurecyberspace) for online voting in mid-August 2019. The most-liked entry will win the “Most Favourite Online Award”. To promote the awareness of information security among schools and their teachers and students, there is a “Supportive School Award” in the Secondary School and Primary School categories respectively to commend the active participation of schools. The top three schools with the highest student participation rate will receive a trophy. For the finalists of each category, each participant will receive a certificate. The Panel of Judges is comprised of representatives of the Hong Kong Comics & Animation Federation, Organisers, Co-organisers and Supporting Organisations. The results decided by the Panel of Judges will be announced in early September 2019. Winners will be notified individually to receive their awards. All finalists will be uploaded to the “共建安全網絡” fan page of Facebook (https://www.facebook.com/buildsecurecyberspace) for online voting in mid-August 2019. The most-liked entry will win the “Most Favourite Online Award”. The poster design must meet the theme “We Together! Secure Data!” to promote information security message on data protection. The size of poster must be A4 of the International paper size (210 mm x 297 mm). The poster must be in colour. If the poster includes any text content, such content should be mainly in Chinese or English language. Entries can be presented with various kinds of drawing tools, such as crayons, watercolour, coloured pencils, computer software, etc. If the entry is hand-drawn, it should not be folded when being submitted. It may also be scanned into an electronic image file (with at least 300 dpi and in PNG, JPG, TIFF or BMP format) for online or email submission. If the entry is produced using computer software, participants are required to submit the raw file and an image file with at least 300 dpi and in PNG, JPG, TIFF, BMP, AI or PSD format. The resolution of the raw file must be at least 300 dpi with CMYK four-colour process printing and the use of clip art defaulted by computer software is not allowed. A title and a brief description (not more than 200 words) of the entry must be included in the application form. The size of each file submitted must be less than or equal to 10MB. If the size of the file is greater than 10MB, please use compression utility to compress it as ZIP format. If anything is missing in the submission, the participants will be disqualified. Late submissions will not be accepted. *All entries must meet the above Basic Specifications of Entries. Participants are required to attach (i) the entry files, and (ii) a completed and signed application form, and email to “event@hkcert.org”. Please mark “We Together! Secure Data!” – Poster Design Contest and the participating category in the subject field of the email. The size of each file submitted must be less than or equal to 10MB. If the size of the file is greater than 10MB, please use compression utility to compress it as ZIP format. If anything is missing in the submission, the participants will be disqualified. Late submissions will not be accepted (the email submission date shall be based on the recipient’s timestamp). Please mark “We Together! Secure Data!” – Poster Design Contest and the participating category on the envelope. If anything is missing in the submission, the participants will be disqualified. Late submissions will not be accepted (the submission date shall be based on the postmark). Participants may enter as an individual or as a team. The maximum number of participants in a team is THREE. For team application of the Secondary School and Primary School categories, all team members must be from the same school. Each participant can enrol to only one of the categories and should submit only one entry. Multiple submissions will result in disqualification. All related entries will be rendered void. All entries must meet the above Basic Specification of Entries. Once an entry and the brief description of design concept are submitted, they cannot be modified or replaced and will not be returned to the participant upon request. All entries must not contain violent, obscene or indecent content. All entries must be original and must not be copied from or drawn by others. Names, products or services of any companies or entities or any third-party trademarks, logos shall not be contained or referred to in all entries. No entries shall be used for the promotion of any brands, products or services. Participants must guarantee that their entries have never been openly shown in any form, and shall not infringe any copyright and intellectual property rights. If the entries had entered other competitions, the participants shall ensure that the copyright of the entries does not belong to any organisations. The participants shall assume legal liability for any disputes over the copyright of the entries. The Organisers and Co-organisers accept no responsibility for such disputes. The copyright of all entries, once submitted, is vested solely in the Organisers. Participants shall agree that the Organisers and Co-organisers can at any time display, reprint, reproduce, use or modify their entries for any purposes. The Organisers and Co-organisers are not required to notify the participants or pay them any fees. Participants shall agree and accept the publishing in any forms and the public display of their entries, and the production of these entries into any items by the Organisers and Co-organisers, e.g. the public display or publishing of the entries in public exhibitions, the websites, social networking sites, mobile applications and publications of the Organisers and Co-organisers; the production of these entries into any items, such as souvenirs, calendars or promotional materials, etc. The Organisers reserve the right to use in whole or in part the design of the entries. The participants shall not raise objection. The Organisers have the right not to accept any improper entries or entries not aligning with the theme and specifications of the contest. If there are doubts that the entries have infringed the intellectual property rights of others or the entries were drawn by others, the Organisers have the right to disqualify them from entering or winning the Contest. The Organisers reserve the right to substitute any prize with another prize of similar value at any time without prior notice. Participants should participate in publicity events related to the contest upon invitation of the Organisers. The results decided by the Panel of Judges shall be final. Participants shall abide by the decisions of the Panel of Judges and shall not raise objection to the results. Participants shall agree and abide by the regulations, terms and conditions of the contest. All persons involved in the organisation and implementation of the contest are not eligible for joining the contest. They include but not limited to members of the organising committee, Panel of Judges and their immediate family members. The Organisers reserve the right to interpret and revise the regulations of the contest and all other terms and conditions set out in the application form. Participants shall not raise objection. Participants have the right of access and correction with respect to their personal data as stipulated in Sections 18 and 22 and Principle 6 of Schedule 1 of the Personal Data (Privacy) Ordinance, and have the right to obtain a copy of their personal data provided in the application form. Please contact the Hong Kong Computer Emergency Response Team Coordination Centre by calling 2788 5617 or by email to event@hkcert.org.